GroVia Swim Diaper is a washable swim diaper which comes in 3 sizes with side snaps, soft terry inner, and stretch sides. Fairly and conscientiously made in China. TOTE PROMO: The first 50 orders containing $50 or more GroVia brand items will receive a FREE GroVia nylon tote bag. While supplies last only. ** NOTE: You can't see if you will get one or not in the checkout, but if your order qualifies, it will arrive in your package. While supplies last. GroVia swim diapers are perfect for the pool, beach, and even sprinkler play. They are great combination of fun and function, featuring an adorable printed waterproof outer, lined with a soft polyester terry inner that will stop solid messes in their tracks. Stretch side snaps give a custom fit and make for easy clean ups. Don't size up in any swim diaper. 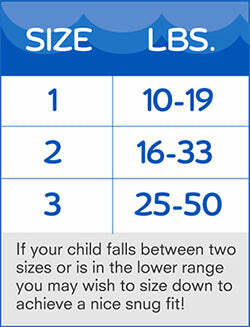 You need the size that will fit correctly because if the swim diaper is too big on baby it may not function properly. Washing: Remove as much solid matter as possible. Place soiled swim diaper in a dry diaper pail. No soaking necessary. Wash on warm with detergent as needed. Tumble dry low. Do NOT use bleach or fabric softeners. Note from Karen: The important thing to know about all washable, reusable swim diapers is that they are designed to contain poop. They are not thick diapers and are not designed to do much at all about pee. They are just for soil containment. 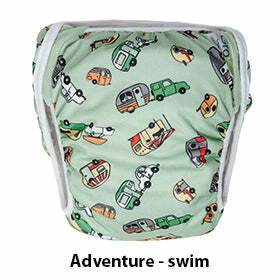 This has some light padding, but don't expect a full pee-flood to be contained fully in the car seat in a swim diaper. Use a diaper when a diaper is needed. 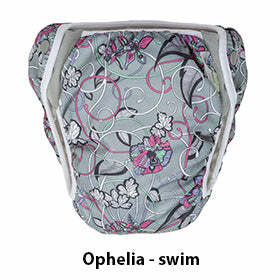 A swim diaper is not the same thing as a diaper and it not the same thing as a diaper cover. The fit is different. Proper swim diapers fit snugly. They will not allow a big air bubble to form inside them and possibly tip baby's face down as the air rides up, which is scary. The snugger shape of the swim diaper means they don't fill up with a big puddle of heavy water when you lift baby out of the water, either. 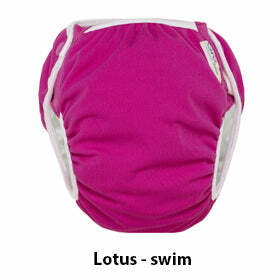 A swim diaper that fits properly shouldn't be very saggy but should fit reasonably snug to the body. We do not suggest using diaper covers as swim diapers. 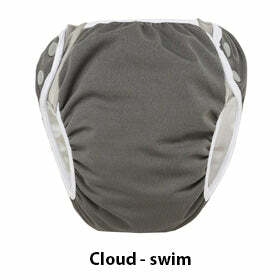 Choose a real swim diaper for swimming. Coordinates with your other GroVia items and GroVia Wet Bag. 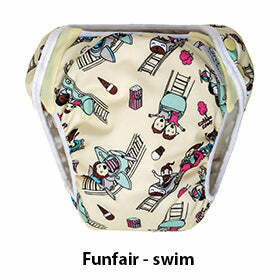 Sizing and fit are great, quality is excellent, and this diaper actually captures poop in the pool! We have continued to buy the same diaper as our daughter grows. 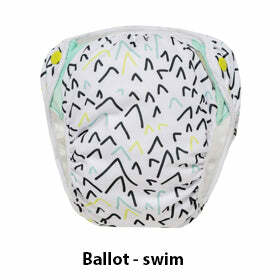 We recently purchased this swim diaper for our 4 month old daughter. She wears it to her swim class weekly and it works great (though we've been lucky and she has not yet pooped in the pool). Plus you've never seen anything cuter than a 4 month old in this swim diaper! She is about 13 pounds and the small is a perfect fit. 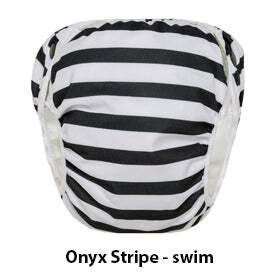 These swim diapers fit snug and are good quality. My daughter never happened to go #2 in them, so I can’t say they for sure contain the poop, but I’m sure there wouldn’t have been issues if she had. It's function and fashion in 1! This diaper works. Once soiled, it did not leak into the pool.